But I can’t help but think it would be a little self serving and a teeny weeny bit untrue if I posted this on my walls. Sure, it may be the family I would want people to see, but it’s not the family that is. We do mad, angry, and frustrated. We do yelling and sibling fights. We do laughter, and silly, and giggles, and fart jokes, and poop jokes, and burp jokes. We do grumpy and happy and lazy and busy. We do stomping and door slamming. We do games and movies. And it’s a good thing or somebody would be dead by now. This entry was posted on June 22, 2012 by kanniduba. It was filed under Silly Stuff and was tagged with family, wall words. I love this. So true, honest – so family life. HA! Your words are excellent!! In this house we do life but not always gracefully. In this house we have raised the making of mistakes to a fine art. Some of them might involve harking up hairballs. We mop up and move on. We forget everything except suppertime. We whine and bark and howl at times both appropriate and in-. We laugh and spin-dance and jump on the bed. We say things we wish we could take back. 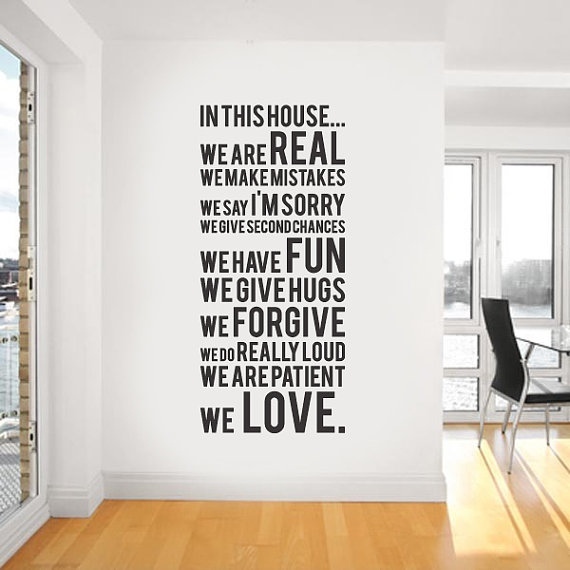 We will come help you paint your excellent words on your wall if you want. Thank you for this wonderful moment. Your last line is a classic! And, yes, families are made up all those things but love is always there to pull them all together. That can take time but worth the effort. Click Me! You Know You Wanna.